The European Stability Mechanism has been downgraded by Moody’s, following a similar drop for France. ESM managing director Klaus Regling said he could not understand the rationale behind Moody's decision to strip the fund of its AAA status. THE EUROZONE’S new permanent bailout fund has been stripped of its triple-A credit rating by the ratings agency Moody’s. The agency last night brought its rating for the ESM down one notch, from the top-level AAA to AA1. The downgrade follows a similar move for France, the fund’s second-largest contributor, which has also recently lost its AAA rating. “Moody’s downgrade of France reflects the rating agency’s view that there has been a marginal diminution in the certainty that the sovereign will fulfil its financial obligations,” the agency said, explaining its moves. “France is the second largest contributor to the two entities’ financial resources, as a provider of callable capital in the case of the ESM”. The European Financial Stability Facility (EFSF), the previous bailout fund from which Ireland receives its bailout loans, was also downgraded – which could make it slightly more expensive for the EFSF to borrow money which it then lends to the Irish government. 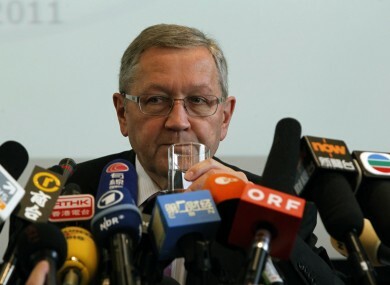 “Moody’s rating decision is difficult to understand,” ESM managing director Klaus Regling said in a statement following the downgrade. “We disagree with the rating agency’s approach which does not sufficiently acknowledge ESM’s exceptionally strong institutional framework, political commitment and capital structure. “In its rating decision even Moody’s stresses the credit strengths of ESM and EFSF due to their low leverage and the creditworthiness of its Member States. Email “Eurozone's new bailout fund loses AAA credit rating”. Feedback on “Eurozone's new bailout fund loses AAA credit rating”.